The Master Plan Implementation Committee was impressed with all of the entries for Turf Battle. As you know from the Turf Battle Open Forum, there was great interest in selecting the best and most feasible aspects from each proposal and incorporating them into one design. We realize that this process was billed as a winner-take-all proposition, but the three proposals complement one another so well. Furthermore, none of the entrants addressed all the issues and challenges facing the site, so an overall plan was needed to fix the entire area. Keith Wagner was hired as the landscape architect for the project. He met with Luther Tenny and I at the Atwater site several weeks ago. We discussed all of the Turf Battle plans, looked the site over, and discussed ideas on the most appropriate treatments for the Atwater area. Keith then drafted a rough sketch of the site; all the entrants should see pieces of their plans in the overall site plan. It is still very much a work in progress, but I’ll go over the plan North to South, (Atwater parking lot to Chateau), give some of our design theories behind the ideas, and hopefully credit appropriately the excellent student work that appears within. The existing stormwater retention pond next to the parking lot suffers from a lack of context, seeming like a piece of landscape that doesn’t fit into the surrounding area. At present,the native, wild planting, surrounded by mown lawn and parking lot floats like a small island in a sea of orderly landscape. All of the contestant’s plans addressed this area to some extent. The Lee-Rosenblatt proposal correctly identified the area as needing some sort of wall, not only to block the view of the parking lot, but to prevent the prevailing winds from blasting through there, the well-known Atwater Wind Tunnel. Their proposal called for a gabion wall as a backdrop to the pond, which was to be turned into a seasonal platform, making the pond functional. The pond is already functional, though, specially designed for stormwater treatment, and due to permitting constraints, any changes to this functionality are not allowed. The new plan does create a wall, however, but utilizes evergreen trees to block wind in all seasons. The Catalano-Madson-Moritz plan puts the pond into the center of a no-mow zone, which is an excellent idea. Lawn transitioning into a no-mow meadow is now part of the landscape vernacular at Middlebury and will help to further blend the pond. More mass plantings of native shrubs and perennials around this pond will further aid in defining this area and placing it in the greater context of the surroundings. Moving uphill (south) in the landscape, four Elms get planted up the long corridor, starting at the west end of the new no-mow, and going up to the new courtyard. We plan to use the new Hybrid elm named Accolade. Its wonderful vase-shaped form in this towering shade tree will help break the strict vertical lines imposed by Halls A+B in the landscape. The L-R proposal correctly speaks to the need to create “several clearly defined outdoor rooms,” which is a great way to approach the site, at present reading like a long corridor. 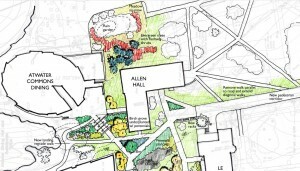 In the new plan, a wall is placed in the grass quad to the west of Hall B. This was a great idea from the C-M-M plan, but moved further south uphill. Their location for the wall, which they called “The Pass”, was located right on top of some major utilities, including a primary power source and steam lines serving both Halls A+B. This would make any major construction or planting inadvisable in this location, as repairs to the underground infrastructure, while infrequent, would destroy any landscaping on the surface. The idea still holds, though, and the basic design principal was a sound one. Not only does a low wall provide horizontal relief in the vertical landscape of the buildings, but as seating and a topographical aid to flatten the grass areas above and below a wall here is a great choice. The wall will also be designed to allow seating, much like The Pass. On the south side of the wall lies a courtyard, paved with concrete. 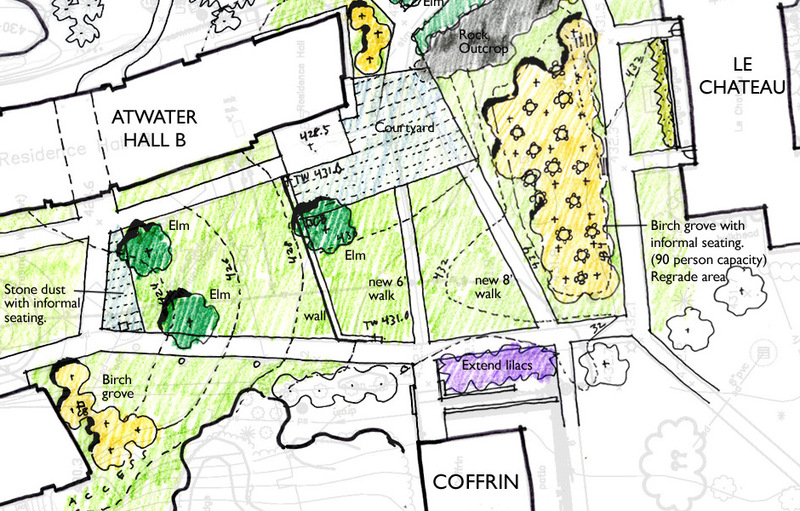 Both the C-M-M plan and the L-R plan call for some sort of courtyard space, both correctly speaking to the need for a more formal outdoor gathering space. 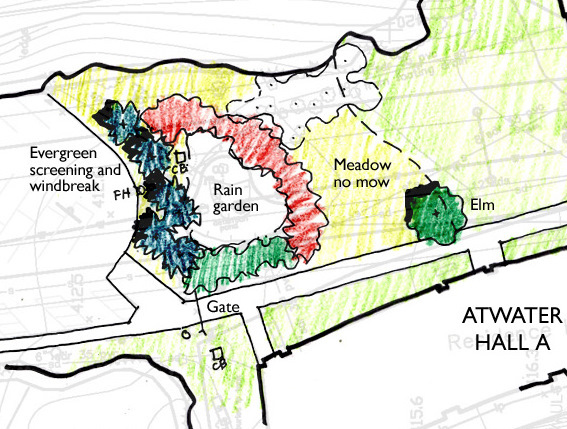 The C-M-M plan calls for two outdoor classrooms, in the area next to Halls A+B where there are no windows. These areas, though, are where the same utility lines that foiled the placement of The Pass enter the residence halls, so pavement on top of these areas is ill-advised. The L-R plan calls for a large courtyard made of crushed gravel, something with a more urban feel to match the existing area. I find gravel not sustainable in the landscape for very long, as herbicides are needed to prevent crabgrass and other weeds from infiltrating the area. Concrete also provides easier snow removal, extending the use of the patio first thing in the spring on those occasional sunny days. The paved patio is placed outside Hall B, just south of the wall, and it surrounds and expands the existing lounge space in Hall B. The C-M-M plan does state the need for gathering spaces at night and the location outside the lounge speaks to this. The nearby wall will also provide seating and a break in the landscape from the more recreational uses of the turf below. This location for the patio also helps in one other problem, the two dirt paths heading west that will become sidewalk, part of the baseline improvements we plan to make to the site. While present use patterns show the need for both these paths, they meet on the east end closely at an existing sidewalk, making an awkward triangle of grass that would be hard to maintain, and would turn to bare dirt. With the placement of the patio the two paths will terminate well separated in the courtyard area. 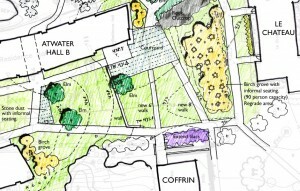 The C-M-M plan calls for the area directly to the north of Chateau to be a grass courtyard, correctly identifying the present use of the space. This area is used for many tables and chairs during language schools, who’ve expressed interest in shade here to make the space more user friendly. The grid of trees in the L-M plan was well received by many people, so we’ve placed this design concept here. The grid of Birch trees is also echoed across campus, both in front of Ross Dining and in Discovery Court south of Bicentennial Hall. By careful placement of these trees we hope to preserve the views to Chipman Hill. Clumps of birch are also used throughout the rest of the Atwater landscape, blocking the views of the harsh southern walls of Halls A+B, as well as the basis for a new planting in the front of Atwater Dining. Let’s jump to the front of the dining hall. Presently there is a dirt path along the southern side of the stairs leading down to the Dining Hall Plaza, caused by bicycles not utilizing the existing ADA ramp. In the center of that ramp, the landscape is that of small trees and large shrubs dotting a mown lawn, a piece of landscape out of context to the surrounding area, similar to the landscaping issues surrounding the retention ponds next to both the Atwater and Johnson parking lot. 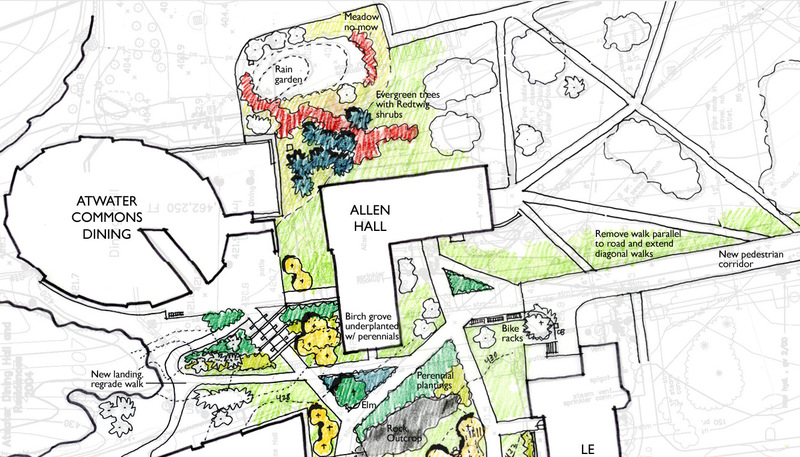 The new plan calls for planting this area and the area next to the stairs with native shrubs and perennials, making the space more inviting and appropriate for the special events held in the dining hall. We are also planting a thick grove of evergreens and native shrubs around the lower retention pond next to the Atwater loading dock, not only for the same reasons as the other retention pond, but to block access along that dirt path that has formed leading to the parking lot. On the west side of Allen presently is an area of crushed gravel, as foot and vehicle traffic has overwhelmed the existing sidewalk infrastructure. We’ve placed a new sidewalk running north to south along the west side of Allen, where it is obvious many people walk from Chateau Road to the dining hall. A triangle area is formed west of this new sidewalk; this becomes another planting bed, part of the new attractive entrance to the dining hall. The center of this bed will utilize an Elm tree linking this section of the landscape together with the lower sections between Halls A+B. Further beautifying this area will be a planted bed of perennials next to the rock ledge, so walking into the Atwater area from the south will be a stroll through a garden. At present, another crushed gravel area is right at the north end of Chateau Road, on the south side of Allen. Bike racks are haphazardly scattered around here. Once again the usage hasn’t matched sidewalk layout. A larger concrete sidewalk area right next to the road not only gives a space for the bike racks, but matches circulation. We will use this area to funnel foot traffic directly onto this service road, turning it into a “Pedestrian Promenade” as the Master Plan calls it, the first one on campus. We will then be able to eliminate the awkward walk now present east of Chateau Road, which was too narrow and hard to maintain in the winter. We hope to begin construction this summer, slipping it into an already busy season. Much work remains on the plan, and, in the spirit of the competition, comments, critiques, ideas and suggestions are welcome. And on a personal note, thanks ever so much to all the contestants. Your ideas and inspirations are going to make this not only a workable landscape, but one of the best areas on Middlebury campus. Your entries for Turf Battle were critical for the formation of the new plan, and the synergy of the contest shows in the final product. Special thanks to Tim Spears for the contest idea and for being the driving force behind this undertaking and to Sarah Franco for helping with the nuts and bolts during the busiest winter I’ve ever had here. Finally, thanks to Luther Tenny, who I swear was a landscape architect in a past life, and to Keith Wagner for his singular vision of the entire area. 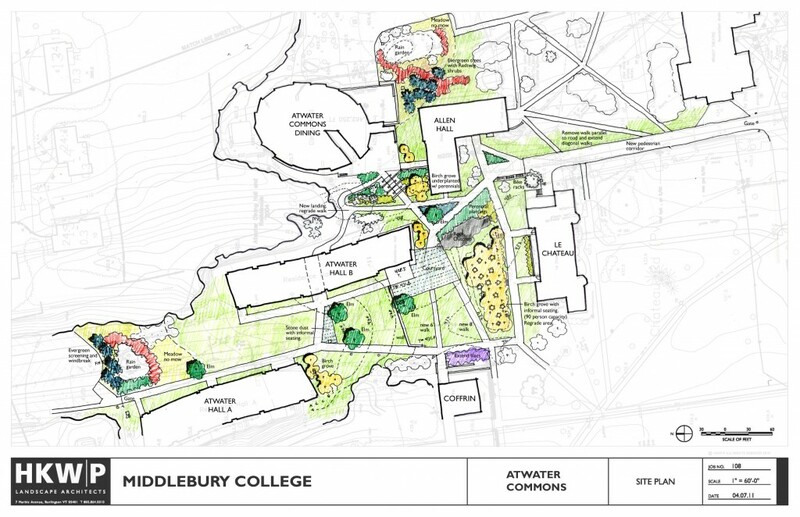 I’ll be keeping the campus updated on the progress of this landscape project on my regular blog, The Middlebury Landscape. This entry was posted in Uncategorized on May 5, 2011 by Tim Parsons.